Latest Events, Information & Tickets. Independent Guide not sponsored by Live Nation! Get ready for the show of a lifetime! On Saturday 4th August 2018, the incredible Sublime with Rome, Lupe Fiasco & New Politics will arrive at the Concord Pavilion!! Get ready for a night of the very best entertainment that money can buy! This is the show we've all been waiting for… Don't miss your chance to be a part of an event that you will never forget! Grab your tickets NOW! The legendary ska punk bassist of Sublime with Rome. Sublime were known for their massive hits "Santeria", "Wrong Way", "Doin' Time", and "April 29, 1992 (Miami)" that were released to U.S. radio. Which gained them sales of over 17 million records worldwide! 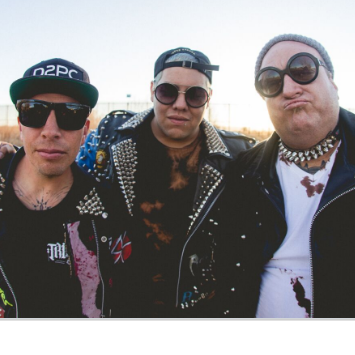 Since the unseen, heartbreaking death of Sublime's vocalist Bradley, the band broke up and bassist Eric Wilson decided to collaborate with singer Rome Ramirez. The new group still performs Sublime classic's – keeping the music going strong! Sublime with Rome have been carrying on the legacy that Sublime created since 2009 where Ramirez began performing with them and since 2010, together they transformed into a new group "Sublime with Rome"… together they take to the stages across North America and festivals around the world such as Smokeout Festival in 2009 and since their debut album was released, Yours Truly, on July 12, 2011. They have pretty much non-stop toured for the last few years. This guys bring all the energy and excitement with them where-ever they go and Concord Pavilion will no doubt be another one to join the vast collection of amazing shows to place under their belts. Join them on their 2018 Angry Orchard 'Rock the Roots' tour where they'll be stopping off along the way to showcase exactly what they do best! !